On Saturday, September 22, 2018, the Elysian Valley Arts Collective presented its 11th Frogtown Artwalk. 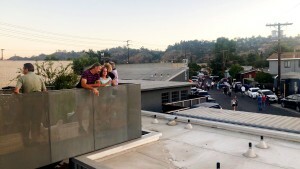 The Artwalk is a celebration of the creativity flourishing in the Elysian Valley (Frogtown) community. This year’s event included 40 Venues, over 50 artists, 3 stages with music, a “literary lounge”, an interactive light installation stretching ½ mile along the LA River, pedi-cabs, live screen-printing, and dance exhibit. FSY Architects was honored to host two artists at its headquarters: Lane Barden and Mimi Phan. 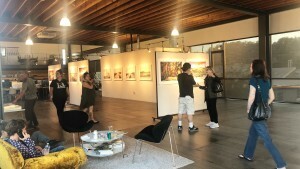 Lane Barden exhibited a series of color photographs printed on canvas, which were taken in the Los Angeles River or looking down into it from bridges between Frogtown and the Seventh Street Bridge. All photographs were digitally processed with an unruly, unpredictable algorithm chosen intentionally to break down the conventional structure of the image and explore the strange beauty of the industrial landscape. They are also meant as a direct commentary on social and environmental issues. Mimi Phan presented an outdoor art installation entitled nhà: a house, a home, a family, which pays homage to the millions of Vietnamese who died trying to flee Vietnam for a better life and those that were left behind. 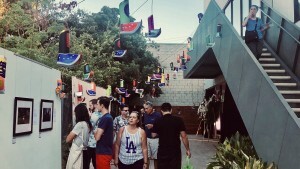 The installation included 250 handmade paper shoes of different colors and patterns, representing a guided pathway through the installation. The Frogtown Artwalk takes place every two years in the Fall.